Is Windows 10 really free? 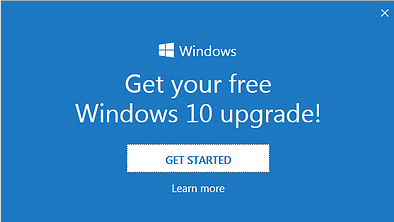 Home » Microsoft » Windows 10 » Is Windows 10 really free? I’ve been asked by friends and colleagues a few times if Windows 10 is really free. maybe because they saw a window popping up on their Windows 7 or Windows 8 computer screen like this? And the answer is NO, Windows 10 is not free. here is what’s going on, In order to encourage adoption of Windows 10, Microsoft is currently running a promotion for Windows 7, and Windows 8 users to upgrade to Windows 10 for free, but the promotion ends July 29th, 2016. I don’t know if Microsoft will extend the promotion period and people will have to pay for the upgrade after that. Prices for Windows 10 standalone licenses are $119 for the Home Edition, and $199 for the Pro edition. There are 4 editions of Windows 10 in total, but home, pro, and enterprise are the most popular. I have to admit though, Microsoft is pushing Windows 10 to Windows 7 and Windows 8 users real hard, and people ask “where’s the catch?” and there is no catch, like I said, Windows 10 is not really free, you need to have a copy of Windows 7 or 8 already installed to upgrade to Windows 10 for free, but indeed, Microsoft wants people using Windows 10 because Windows 10 is so damn good at tracking users, and tracking people helps with targeting advertisement which Microsoft is selling on their Bing search results. the first thing I noticed when I upgraded to Windows 10 is how tightly integrated social media, Cortana, Bing, and cloud services are in this OS. In fact, you cannot even get rid of OneDrive without going through the hoops of modifying the registry, and many other settings, just to disable the damn thing. its scary, but it seems like the most profitable business right now is tracking people. Google was just named the most profitable company in the world, and Google is the king of kings when it comes to tracking user data.of course, Microsoft does not want to be scooped out from that honey pot, so they crafted their strategy in Windows 10. Do you know what has been Microsoft strategy its entire life? defaults!! Internet Explorer became the most popular browser a few years ago because it was already built-in in Windows by default, and so were so many popular Microsoft applications we use today, in Windows 10, Bing and Cortana are tightly integrated, and I assume as Windows 10 goes up in popularity, so will Bing. all of a sudden Microsoft will rule the search market, at least on the desktop!. So No, Windows 10 is not free, and never expect anything free from Microsoft. Is upgrading to Windows 10 worthy?